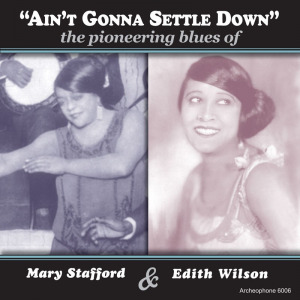 "Ain't Gonna Settle Down" features all 14 recordings made by the obscure but remarkable cabaret star Mary Stafford in 1921 and 1926 and 32 selections by Louisville-born Edith Wilson, covering her entire released repertoire from 1921 to 1930. A handsomely illustrated 32-page booklet with notes by blues scholar Steve Tracy accompanies the two CDs. These records have never sounded better, and for the first time they are presented with the care they deserve. Visit Ain't Gonna Settle Down's expanded catalogue page to see the complete track listing, read an extended description, and listen to sound samples.